I didn’t make my usual 7:00 am posting time today. You see, I usually write my posts a day in advance and then they are ready for posting in the morning. But the weekend was such a whirlwind of Christmas activity that I never got a chance. Forgive me for being late? Our Christmas was wonderful. Family and friends gathered at our home on Christmas Eve to eat and celebrate with us. We had traditional Swedish foods, of course, and mostly just spent the evening enjoying everyone’s company. Christmas morning got off to a slow start. You know you have a teenager when she doesn’t even got up until 9 am on Christmas! We spent the morning opening gifts, drinking coffee and eating leftovers. Then we spent the afternoon leisurely preparing the prime rib and some side dishes for dinner at my father-in-law’s house. Thirteen of us gathered for an early evening dinner and it was so nice to have everyone together at the same table! The food was fabulous, everyone helped and it was a great meal. Let’s see. What’s left to tell you? Oh, my gifts. I got some wonderful things from Dale and the kids and other family members. In the end, everything fit in my new, gigantic L.L. Bean bag. My new Hitchhiker Wheel. Thanks, Dale. Glad your holiday was merry & bright! I’m so glad to hear that you had such a nice holiday! It looks like you got some lovely gifts. I love the LL Bean tote bags. I have a couple of the really big ones, and I use them all the time. Very handy! Enjoy the new wheel, too. You? Are going to need to build a new house for all the wheels!!!! Those things are so damn cute. And now you’re at six, I had just caught up to you and you’re one ahead again! That Dale! He is such a sweetpea. Have a wonderful new year, too, lady! Wow! Cute hitchhiker! That bag will make a nice carrying case for it, but probably not with all the other presents still in there. WOW–You must have been a real good girl this year!! You can sure put a lot of “fiber” in that LL Bean bag!!! I was just telling my mom that this is the first year both Jason and I were up before both boys, pretty amazing! Now THAT’S a gift! Yeah, the teen thing…can’t even get a kidlike grin at Christmas-until they start opening that is. A very Merry season to you and yours. Enjoy! WHat a unique looking wheel!! I can’t believe you got another wheel. 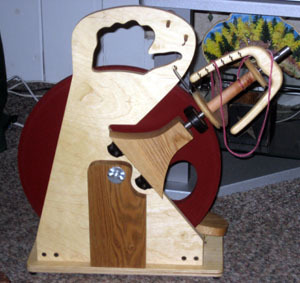 You’ll be able to start your own spinning wheel museum soon! Wow! What a fun looking wheel. I’ve never even heard of that one. Love the LL Bean bag too. Think of the fiber you could care in that baby!! Look at you… hitchin’ a ride! I saw (and even spun on) Ann’s at Rhinebeck — the most adorable little wheel ever! Gone are the days of trying to hold off the child. My baby is 21 and didn’t get up until noon (and then only because that’s what time her boyfriend came over). This year I was the one anxiously awaiting for her to get up! so I know what fits into the Bean bag… have wheel, will travel! Fabulous! A day of warm family, food, AND a new Hitcher. Such fun! Great wheel! My boys didn’t get up until after 8 and they are 9 and 4. I had to wake the youngest up so that he would be ready when everyone got there! That Dale…..he’s a GOOD man! Dale gets ANOTHER gold star. Wow. Go Dale! That’s a good hubby. What a wonderful day puncuated by wheel acquisition #6! Wow! Another gold star indeed for Dale. Does Dale have a gay brother by any chance??? cool new toys! I’ve never seen a wheel like that one. wow. 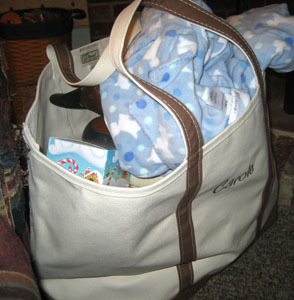 I got an LL Bean tote bag, too – isn’t it great? You will love your hitch hiker! I take mine camping all the time. Why use that beautiful new bag for your wheel – you can a similar one at Ocean State Job Lot for $6 that fits the wheel perfectly! Glad your Xmas was great. I have to tell you in that photo you posted of your new wheel… it sure does look like an odd duck! But I bet it spins wonderfully. Merry Christmas indeed. Have fun with your new toy. you’re lucky you have grandchildren, i mean really, what’s the point of my having a son who got married at an early age, if he doesn’t fork over a grandbaby!! !